This photo was taken by Dan Thomas mid December 2000. 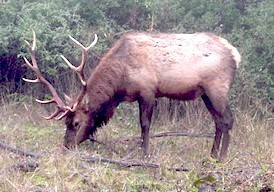 Small herd of elk has been seen and photographed in Shelter Cove area. Here is a couple of juvenile elk from that heard. This photo was taken by Dan Thomas at the end of April 2000. LOST COAST Connections in the heart of the REDWOODS.. From Big Sur to Crescent City, the North Coast has a uniqueness that is the PEARL of the "California Experience". With the small fishing hamlet of Shelter Cove being the highlight of this band of beaches and tide pools. Hikers, surfers, anglers, golfers, artists, swimmers come see for yourselves. Shelter Cove and the Richardson's Grove are awaiting your visit make it your end spot on a International Junket, a Summer "Get Away", or a Weekend "Fly In". Use "the Directory" for pages of the good folks that are wanting to meet you. If you are looking for a Vacation spot, where you can find surfing, hiking, real estatcharter boats, fishing, scuba diving, golfing, a marina, mountain biking, retirement homes, Airport, kayaking, eco-tourism, wildlife, bird watching, whale watching, the Lost Coast, California state parks, national forests, Motels, Inns, Lodging, camping, Bed & Breakfasts in the area, Then look around here.